The plants are doing well. They are getting established and growing new roots and there are lots of blooms already. We’re excited everything is doing well. We also got some plant donations from Treasure island, so thanks to them for some Day Lilies. They were planted with the grasses on the north side of the building. That’s looking much better now with more plants in it. We also got some ice plants from Plant Select that were placed amongst the garden. Plans for the garden are moving along. Now that it’s tested, amended, prepared and planted and the irrigation is in the next step is to put signage in the garden. We are in the process of having name plates made for each variety of plant. We will have a Weld County Demo Garden sign placed and also a CSU Extension sign in the garden. We are also planning a grand opening with a ribbon cutting ceremony during the Weld County Fair – Stay tuned!! Thanks to Master Gardener Noel Johnston we have an information kiosk. 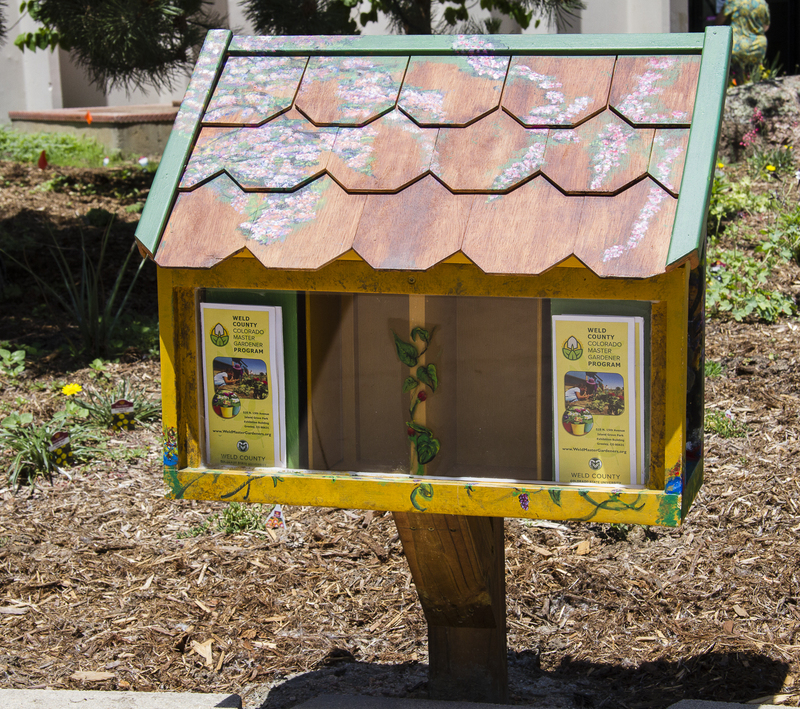 We will keep it full of Weld County Master Gardener information as well as garden brochures etc. Noel built it and his wife painted it and it was installed last week. Thanks Noel. Looks great. If you are near the Island Grove Fairgrounds come take a peek at the garden. This entry was posted in Colorado Master Gardeners, Demo Garden, Garden design, Uncategorized, Weld County Extension and tagged City of Greeley Conservation, Colorado Garden Foundation, Colorado Master Gardeners, creating a new garden, CSU extension, Demo Garden, designing a garden, designing a new garden, Garden design, garden in a box, low water garden, master gardeners, renovating a garden, Weld County, Weld County Colorado Master Gardeners, Weld County CSU Extension, Weld County Extension, Weld County Master Gardeners. Bookmark the permalink. 3 Responses to It’s looking good!! It is looking wonderful. Are you following a plan or do you have guidelines for a demonstration garden? I find it to be a very interesting project. Hi Judy, I’m going to get an answer to this. I don’t know if there if an “official” definition of a demo garden within the extension but I’ll find out. Here’s an answer to what a demo garden is. No real “official” explanation but any garden that teaches or educates. From our Hort agent “There are not any real guidelines other than a demonstration garden has plants labeled throughout that show the common and scientific name of the plant, and are for educational purposes. There are demonstration gardens all over the country, just some are called botanical gardens or display gardens. I did find these articles from the Journal of Extension that explain what at demonstration garden is, along with the logistics of these gardens.